Sparkly Runner: Race Review: 2014 Disney Wine & Dine Half Marathon ( 11/8/2014), or: "Look around, leaves are brown, there's a patch of snow on the ground..."
Race Review: 2014 Disney Wine & Dine Half Marathon ( 11/8/2014), or: "Look around, leaves are brown, there's a patch of snow on the ground..."
Sarah's note- Good morning! I hope you all enjoy this guest post by a dear blogger friend of mine, Matt! 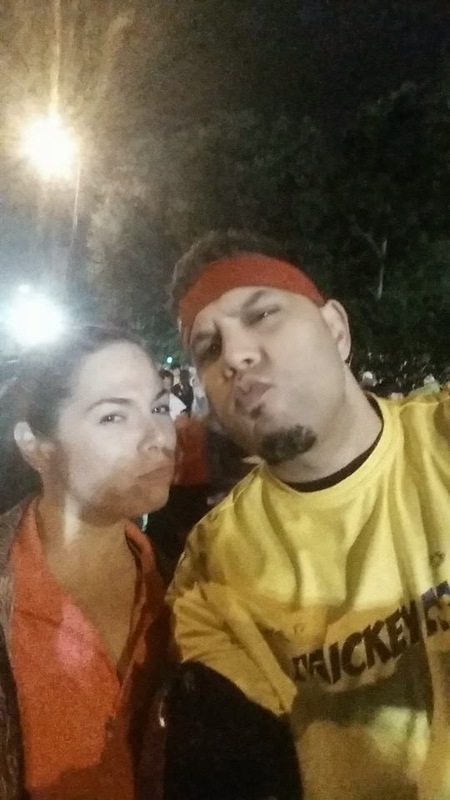 Since I didn't run Wine & Dine this year and he did, he wrote an awesome recap of the race that he has graciously allowed me to share with you. I love Matt's blog and I know you'll love this recap. Enjoy! There was this magical moment of clarity that occurred as I turned eastbound onto the Osceola Parkway, brushing away the little demons of stinkin'-thinkin' who were trying to convince me that I'd be battling hypothermia by the end of the night, during which only one thought permeated the little gray cells of my celebrated noggin: How in the wide, wide world of sports am I ever going to review this race? 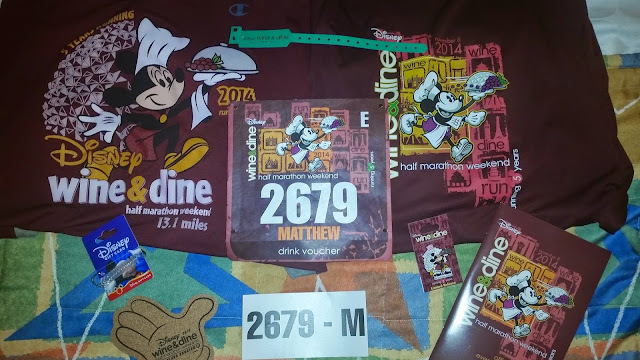 Let us draw a measure of frankness when it comes to the 2014 Disney Wine & Dine Half Marathon: this review is probably not the review you'd want to read if you were looking for the definitive... nay, quintessential recap of what is widely considered to be Run Disney's fan-favorite race event. I mean, what's not to love? It's a night race during a much cooler time of the year for Florida. 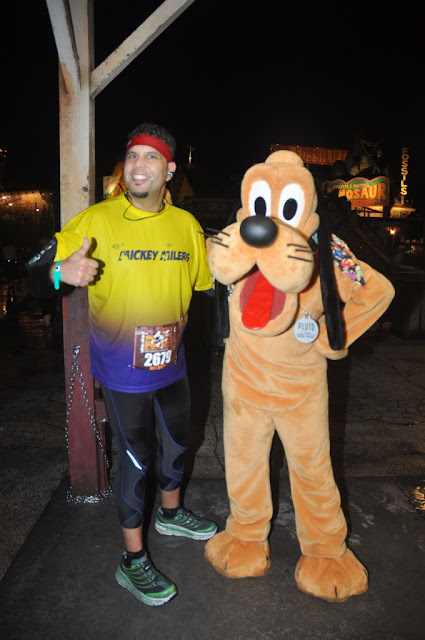 The half-marathon course is unique to this race (the WDW Half and Princess Half are essentially the exact same course) and takes you through three Disney theme parks. And it takes place during the start of the holiday season, so you get to see some awesome decorations along the way. 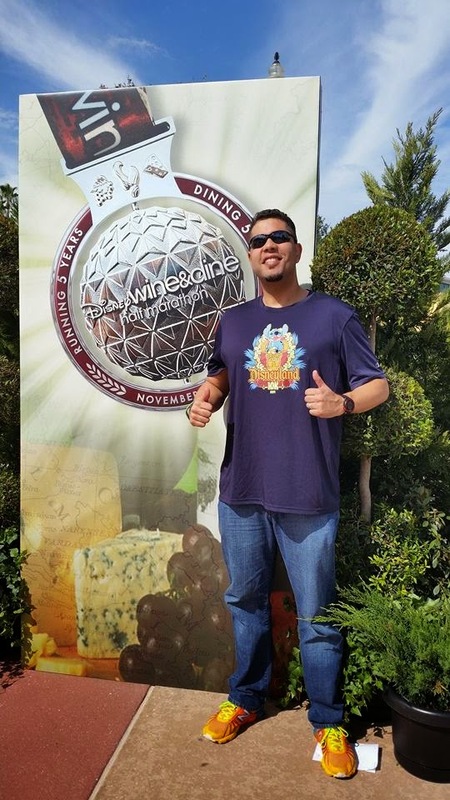 But let's not forget the biggest lure -- after the race, there's a private after-party at Epcot for runners (and their guests, but you have to pay extra for them) showcasing the Food & Wine Festival, one of THE most essential (and beloved) of all Disney events. So you have a Run Disney race! In cool weather! Costumes! Music! Happiness! Holidays! Medals! Rudy and Carissa! Jeff Galloway! Food! BOOZE! What is not to love?? Let's dial it back a bit to the sweet, sunny morning of Saturday, November 8th, 2014. Boots and I drove up from our home in Fort Lauderdale the previous night, checking into All Star Sports around 11 PM. It was a cool, clear night, and I'm thinking, "Man if this holds, we're gonna have some perfect running weather!" Mm-hmm. After settling in, unpacking, and constructing the traditional hotel room fort, we passed out in anticipation of the following morning's carb-load. And what a carb-load it was! 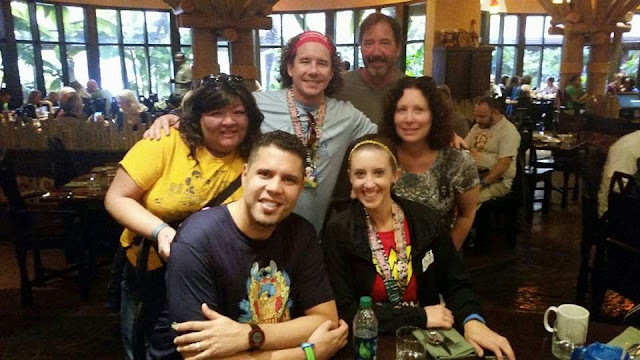 At 9:45 AM we were entering the Jambo House lobby at Animal Kingdom Lodge, where we met the Sparkly Runner herself, boyfriend Matthew, and her Dad and his girlfriend for a massively awesome chow-down at Boma. 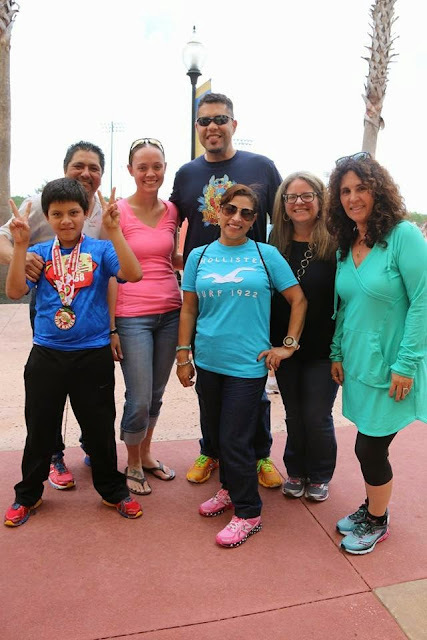 We hadn't seen Sarah and Matthew since the 2014 Walt Disney World Marathon Weekend the previous January, so it was good to see some familiar friendly faces and catch up. And of course the food was exquisite! I've blogged about Boma and speak of it often and with rapt eagerness. It's pretty much one of the best dining options available on-property, and the variety (and quality) of breakfast/brunch items available made for a pretty awesome time with some good friends. 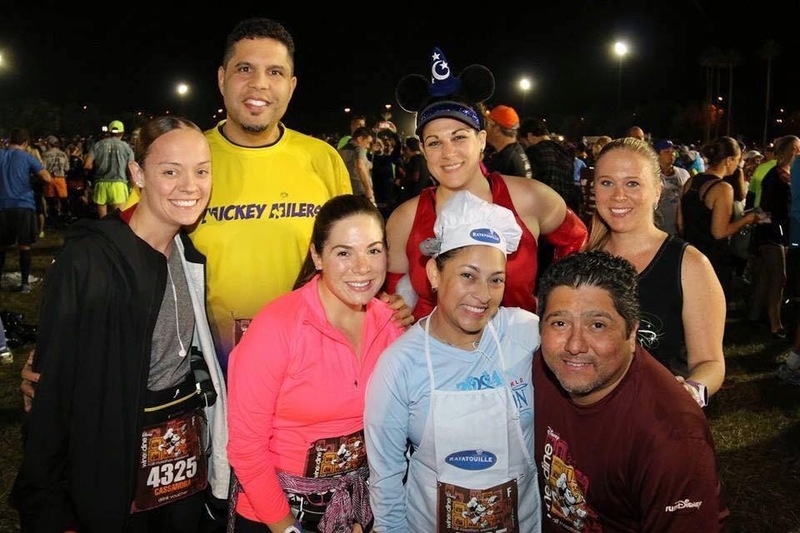 If you're running a night race at Disney, you can't do much better than carbing up here. The cool kids at Boma! After bidding our awesome buddies adieu and *ahem* waddling contentedly out of Boma, we drove over to ESPN Wide World of Sports to hit the Expo. If you've ever attended the Expo at a Walt Disney World race, you pretty much know what to expect from the routine: park your car, go to the Field House to pick up your bib, go to the Josten's Center to get your race shirt and browse the merchandise, listen to speakers, stand in line forever just to get a free banana or 1/15th scale Clif bar, try to capture a pic with Jeff Galloway, register yourself for runner tracking if you haven't done so already, grab a cupcake, and slither back from whence you came. Simple right? What's this about my Eternal Soul? 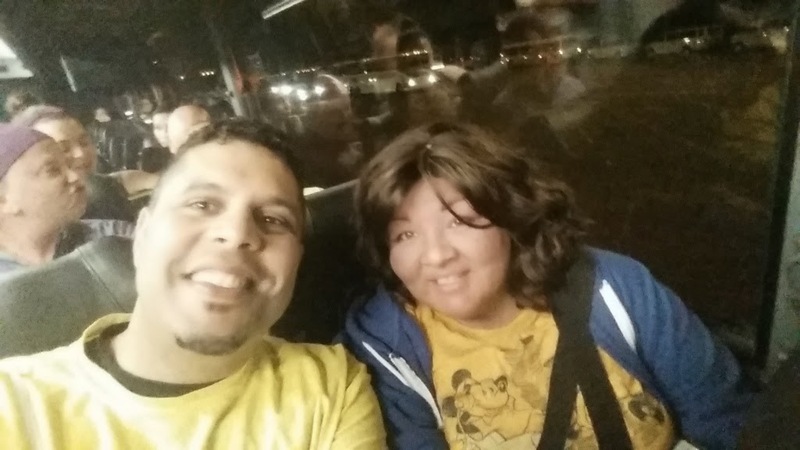 Rosa's son Danny thought all these nutty grown-ups were "real cool," if you "sense my meaning." The Josten's Center was bustling with the usual excitement: shirt pickup, vendors, speakers, the works. I grabbed my race shirt and picked up a sharp looking tech shirt at the Official Merchandise area, but that was it. None of the other merch really screamed out to me, I guess. Anyhow I was saving my shekels for the Avengers race the following week. I went to a Run Disney volunteer to ask where I could pick up Boots's After Party ticket... and was promptly told I had to pick it up at the Field House... from where we had just left. OK I knew that someone had to know the proper answer, so I kept pestering other Information Desk volunteers until someone suggested I go to the Welcome Center, which we did, and after some headaches over "confirmation numbers", we were able to pick up her party ticket. What an ordeal. I went light on the swag this time. Sometimes I tend to go a little quackers. After that it was time to change and get everything ready for the race. The weather report called for temperatures starting in the mid-60s and dropping to the mid-50s over the course of the night, and a near 100% chance of rain. Exactly how MUCH rain was still the big question. It could have been anything from light sprinkles to a torrential monsoon. 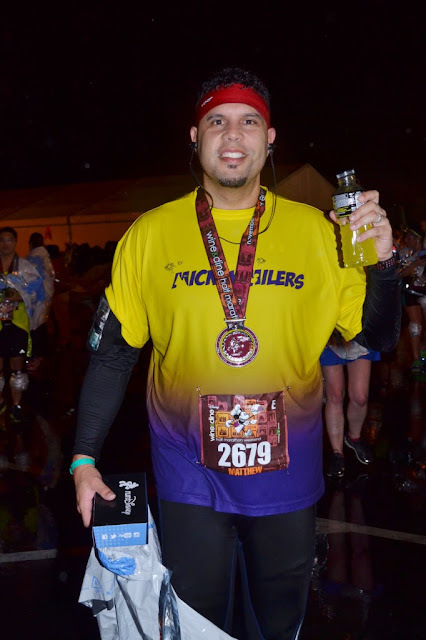 I decided to go with full compression gear, long-sleeve shirt and tights, to keep me warm and mostly dry (I wore my Mickey Milers team jersey over the compression shirt). After pinning my bib on, getting fully dressed and filling up my gear check bag with a fresh pair of clothes, towels, deodorant, a Hefty bag, and my race gear, Boots and I hit the road and made our way over to Epcot to board the shuttle to ESPN Wide World of Sports. After parking at Epcot, it was a quick walk over to the shuttle boarding area. The line was pretty long but we were up and boarded in about 10 minutes. The drive to ESPN Wide World of Sports, on the other hand, took nearly half an hour. The traffic on Victory Way was just a mountain of Ugh. But we had little choice, except to sit there with barely any air conditioning and sing along to 80's "classics" on the stereo system. I may or may not have sung Michael Sembello's Maniac in a high falsetto. Take that for whatever you think it means. But we arrived at ESPN WWoS eventually, and after making our way through security I walked over to the Mickey Milers team meet-up, where, for the third time in a row, I was a few minutes late and missed the team picture. Ye gods, I was a bit chafed, but it was still nice catching up with everyone. After chatting it up with some buddies and snapping some pics, Boots and I walked over to Gear Check, checked my bag in, and met up with our FIT entourage of Cassandra, Rosa, Francesca, Kari, Sandra, and Julie. More chatting, more pics, a last-minute Porto-Potty pit stop, and we were off to our corrals. I kissed Boots goodbye, as she was leaving to catch the Jay & Silent Bob show at the Improv. Francesca and I walked over to corral E and waited for the show to begin. And here's where the fun REALLY starts. Up until now, the weather had been pretty moderate and dry. We're talking about 66 degrees, maybe, with reasonable humidity and a breeze. I was actually feeling a bit warm in my compression gear, wondering whether or not I had perhaps made a tactical mistake in putting on all that get-up, getting nervous that I might actually end up overheating during the race. Fifteen minutes before the race began, it started to rain. A light rain, perhaps even a steady drizzle, but rain nonetheless. Not a drop of precipitation had fallen from the heavens for weeks before this race, and minutes before it commenced, the skies opened up and unleashed torrents of havoc. And slowly, steadily, over the course of the night, it continued to rain, harder and harder over time. It was never anything like a severe shower, a monsoon, or even a thunderstorm... but it was a steady, continuous rain. A COLD steady continuous rain. Temperatures began to drop almost immediately. By the time we crossed the Start Line -- roughly about 10:12 PM -- it was in the upper 50s, breezy, and very, very wet. A quick perusal of the course shows why this is such a celebrated run. 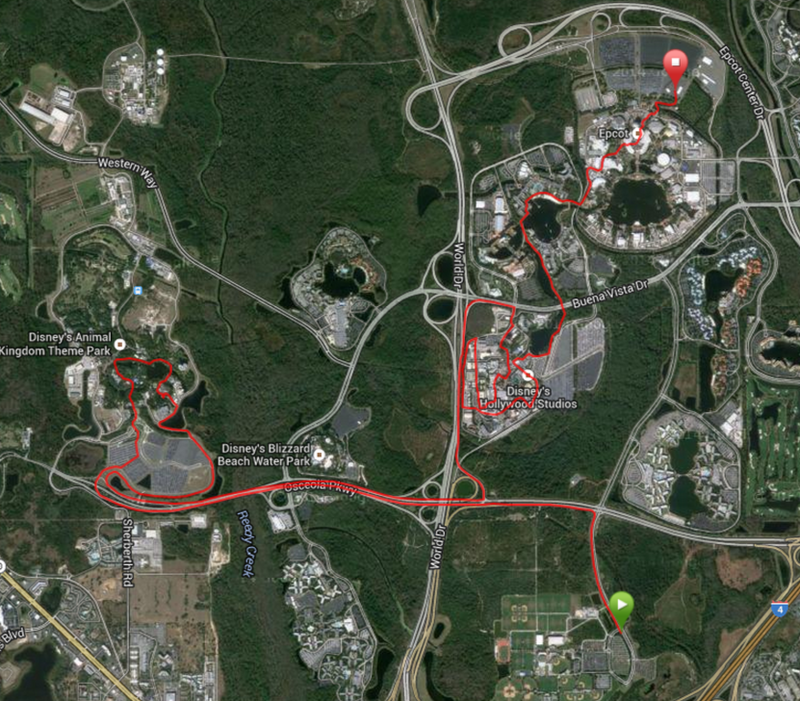 After leaving the ESPN Wide World of Sports, you head west down Osceola Parkway, then looping through Animal Kingdom. After leaving Animal Kingdom, it's a return east down Osceola until you reach World Drive. A turn to the north takes you to Buena Vista Drive and into Disney's Hollywood Studios for a few miles. Finally as you exit the Studios, the course takes you down a pathway past the Epcot resorts (Swan and Dolphin and Boardwalk), turning towards Epcot as you run adjacent to the Yacht and Beach Club Resorts. The last mile of the race takes you through Epcot and to the Finish Line in the Epcot parking lot. ... provided that you don't DROWN first. If it hadn't been raining so much, there would have been much more entertainment on the course. Right around Mile 1 I saw the Country Bears lined up for a photo op, and later on I caught the Green Army Men and the usual Captain Jack Sparrow with pirate ship out and about. But during the long stretches of nothing on the Osceola Parkway, there was almost nothing out there other than water stops. No bands, no DJs, no music, no video screens -- it was a big stretch of empty. We even passed by some backdrops for photos that were entirely unlit and devoid of characters. This, of course, could NOT be helped, as it would have presented massive safety and electrical issues. So make no mistake, you can hardly fault Run Disney for inclement weather! Furthermore, there were photo ops in the parks, but they were limited to a bare handful of characters, and mostly under overhangs, patios, anywhere out of the rain. Usually without any kind of backdrop. Again, this was disappointing but could not be helped by Run Disney. I did manage to catch a pic with this fine Pooch! If it hadn't been raining so much, there would have been more photographers on the course. 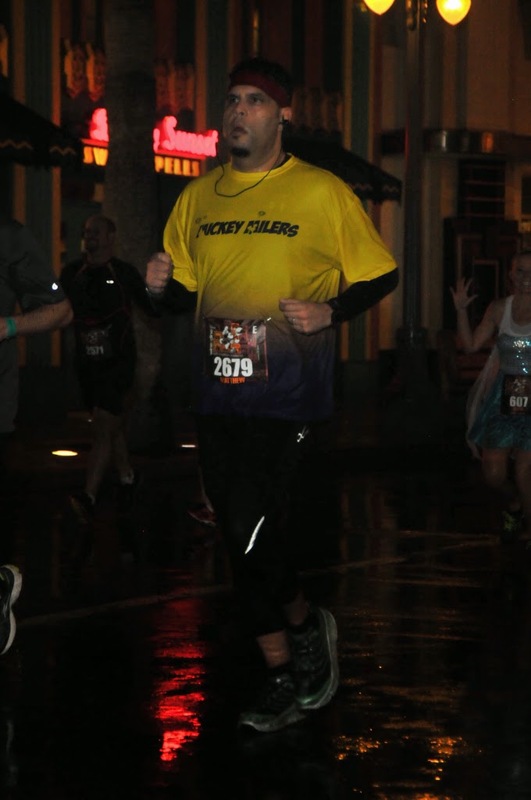 MarathonFoto are some of the most egregious price-gougers around when it comes to your race photos, but I usually end up buying them if I can find a few good pics. But their freelance photographers are out there for several hours at a time, usually with thousands of dollars of their own equipment, and one can hardly expect them to risk damaging their livelihoods by having their cameras and lenses destroyed. 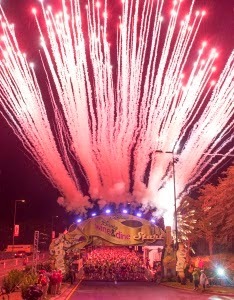 As a result of this, most of the photographers were loosely scattered in the parks and at the Finish Line. On the bright side, I got more Finish Line pics than ever before. If it hadn't been raining so much, there would have been much more visibility on the course. Of course, this being a night race, you're not going to be able have those sweeping views afforded by the daytime. But with the consistent rain, your vision and concentration are almost entirely focused on where your feet are landing, avoiding puddles, while staying ever more vigilant on other runners who were running slower than normally. Furthermore, the reduced visibility often messed with your sense of direction. As I was running through Animal Kingdom, I was wondering when I was going to pass Expedition Everest. It wasn't until I was passing the Finding Nemo building that I realized I already had. Rats! If it hadn't been raining so much, there would have been much better footing on the course. I can't stress this enough, as it was by far the biggest obstacle of the night. From the very get-go, the roads were extremely slippery. Remember that the rain had started literally minutes before the race began, and as a result all of the oil embedded in the roads was brought immediately to the surface. This meant that while the ensuing slipperiness of the surface area would eventually wash away from the rain, this would take several hours to accomplish. I saw three runners slip and fall hard during the race, but I also saw several more recovering from such spills. This meant that, for the entirety of the race, you had to be entirely mindful of your foot-strike and running form. This became even more difficult on certain banked roads, like the one off the Osceola Parkway leading into Animal Kingdom. It was pitched like a motor speedway, which meant you were not only running on a very slippery surface, but also on a highly uneven one. Some of the paved areas in the parks as well as the resorts were also extremely slippery, and required extra caution. And let's talk about those puddles! This was also a pretty big issue. There were many substantial puddles littering the course, which meant you had to stay consistently aware of what you were running into at all times, as well aware of runners swerving or leaping to avoid them. I have to praise Run Disney for assembling a few volunteers who were out there warning runners to stay to the side of the roads and pathways when large puddles were ahead. This was pro-active thinking, and successful thinking at that. I'm grateful that I wore my Hoka Stinson Tarmacs, as the extra elevation helped me navigate those puddles much more successfully -- although not entirely so. Cold squishy feet during a run is not the most fun feeling in the world. Finally, if it hadn't been raining so much, it wouldn't have felt so gosh-darn cold on the course! Listen, I get it; I'm a South Florida iguana. If it gets below 65 degrees I consider it to something along those lines of another Ice Age. Still, not only do I love running in cooler temperatures, I pretty much worship it. However once you're soaking wet with a bunch of miles ahead of you, that 56 degrees starts to feel a little (wait for the hyperbole... wait for it!) hypothermic. Your body naturally warms itself up as you're expending energy, especially while running, but you can never really shake that feeling of shivering cold; ESPECIALLY while on a walk break. Again, Acts of God and the Weather Fairies can't be controlled by Run Disney, but I'd be remiss to left any of this out of my review. I also have to say I was grateful to myself for packing the compression gear. It kept me fairly warm and mostly dry throughout the entire run. That extra layer helped immensely when it came to keeping this reptile from going into hibernation. My only exposed areas were the shins, hands, and head. Keeping my legs and torso warm and dry made all the difference in the world. Trust me, I do NOT have the body-type to wear any kind of form-fitting spandex with any kind of pride, but I'll go ahead and look plenty goofy it means staying comfortable throughout a race. Well! Those were all the bummers, but do you know what? I still had a good time during the run! I knew, given the weather conditions and adverse course environment, that I wasn't going to approximate anything remotely close to a good race pace. And that was cool. I was out there to run and have a good time, and that's exactly what I did. Rainy or not, slippery or not, it's always still great fun running through the parks, high-fiving characters and cast members, and enjoying the views when you have them. The Osborne Lights in Hollywood Studios were absolutely a beaut, although I noticed few people stopping to admire and photograph them (due to the weather, no doubt). Also, the "Laser Tunnel Corridor" thing by the Finish Line was one of the coolest parts to run through, giving you a bit of "last-minute emotional oomph" as you round the corner to finish your race. And hats off to all the race volunteers who stuck it out in the cold, wind, and rain to serve water and Powerade and cheer the runners on. I thanked each and every one of them that I could. Good show, folks. 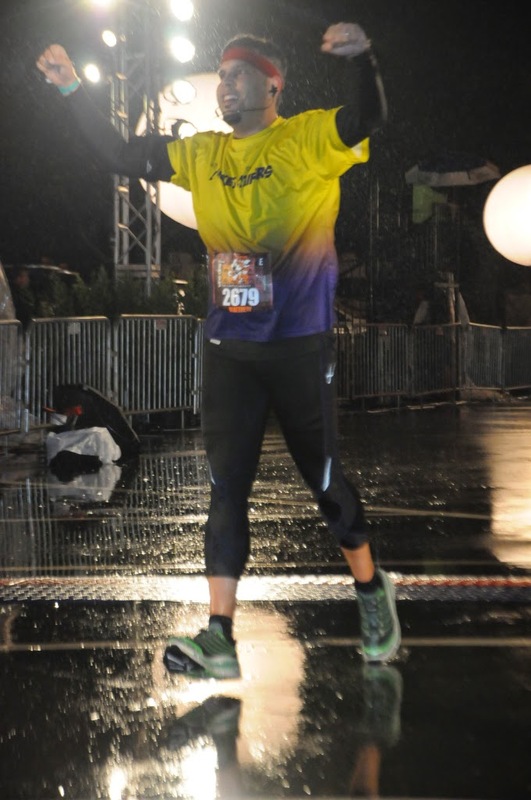 I crossed the finish line with a race time of 2:17:49, a time with which I was particularly surprised. Given everything I laid out in the paragraphs above, I felt I ran much slower and steadier than I normally do, and consequently wasn't concerned or preoccupied with time. I figured I'd be somewhere around the 2:25 to 2:30 mark, which I'd have been fine with. All things being equal, I was pretty pleased with coming in under 2:20. I didn't even check my Garmin until a few minutes afterward; I was just happy to have finished, period. There were a few notable occurrences that came after crossing the Finish Line. I walked over to receive my medal from the volunteers, and believe you me, it was a nice one; a spinning medal celebrating the 5th running of the race. A volunteer placed it around my neck, and I made my way over toward the exit chute. About 30 seconds later, another runner came up and tapped my shoulder. Apparently the spinning portion of the medal had popped out of its hinge and fell without me knowing it. I thanked him and went back to the volunteers to exchange my medal for a non-broken one, which they did without any hesitation. Sadly, this wasn't an isolated incident There were dozens of reports all over social media about broken medals and how/if you could replace or repair them. 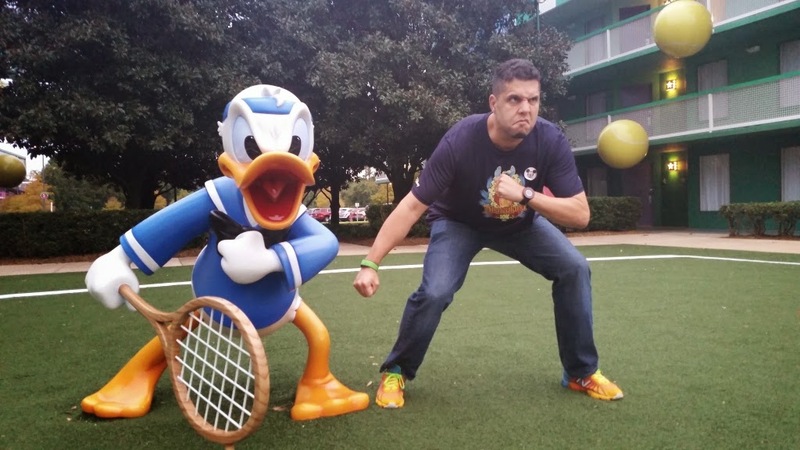 If you're reading this blog and received a broken medal, contact Run Disney to find out how to get a replacement. Anyway, after gathering the requisite Powerade, banana, and snack box, it was time to pick up my gear bag so I could change into some dry clothes. Bear in mind it was still cold, wet, and windy out, we were no longer running, our body temperatures were lowered, and as such the cold felt that much more pronounced. My heart sunk a bit as I saw the line for gear pickup. I spent about 20 minutes and change in the Mc-Q gear line, and I had to keep stretching and moving to keep my body warm and my muscles from locking up. 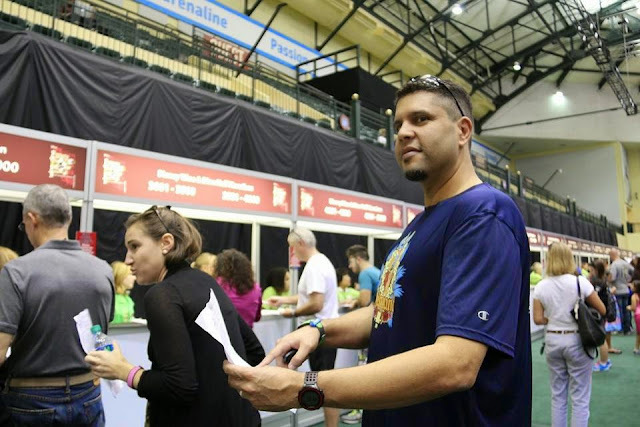 I spent the time chatting away with several runners, many of whom were also planning on doing the Avengers race the following weekend (and the Space Coast Marathon at the end of the month). 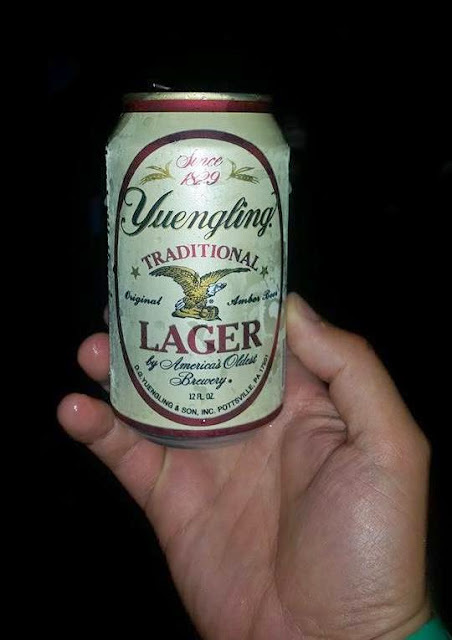 Canned... but I'll take it. You'd be so very, very wrong. Finally, all that was left was to hit the Change Tent, dry off, and change into some warm clothes. The Men's Tent was really crowded but I was able to stake out a corner with just enough room to get things done. Run Disney placed the tents on a grass hill, which meant a cold, wet floor of grass. Yecch. Thankfully I still had my mylar blanket that they had given to runners at the Finish Line, so I laid it out on the ground and used it as a mat. It still took awhile due to limited space and mobility, but a warm towel and clean dry clothes (plus a smidgeon of deodorant) never felt so good before. Boots's show had run very late, so she wasn't able to make it to the After Party. Sadly, the weather wasn't entirely cooperating either, as a lot of people were tired and wet and cold, and many runners wound up skipping it entirely. I made my way into Epcot, walked right up and into Spaceship Earth, sat down in my time machine and just answered texts, emails, and Facebook messages for awhile. I then met Matthew and Sarah by the Camera Center and we hung for a little bit. After bidding both of them adieu (see you cool kids in January!) I grabbed a bite over at the Puerto Rico booth (which was rather unimpressive; I've had better tostones at a gas station! ), after which I realized I'd be much better off back in our hotel room, showered, warm, and cozy in bed. It was well past 2:30 AM at this point, so I walked back out of Epcot and boarded a shuttle that took me directly to the All Star Sports resort. I've never done Wine and Dine. I'm not a big fan of running in the dark, even less so in the cold! It is disappointing when you pay a lot of money and plan for a long time and then something random happens to make it less than you were hoping for. Hopefully next time will be better. Thanks for the recap! Jennifer, I was thinking the same thing! I think I would have been disappointed to not have as many characters or DJ's out on the course when I'd paid so much money for the race. Kudos for finishing in such tough conditions and staying positive. I'm thinking of this one next year too.